If you buy candy in bulk, you may be wondering if there's a point at which it will go bad. 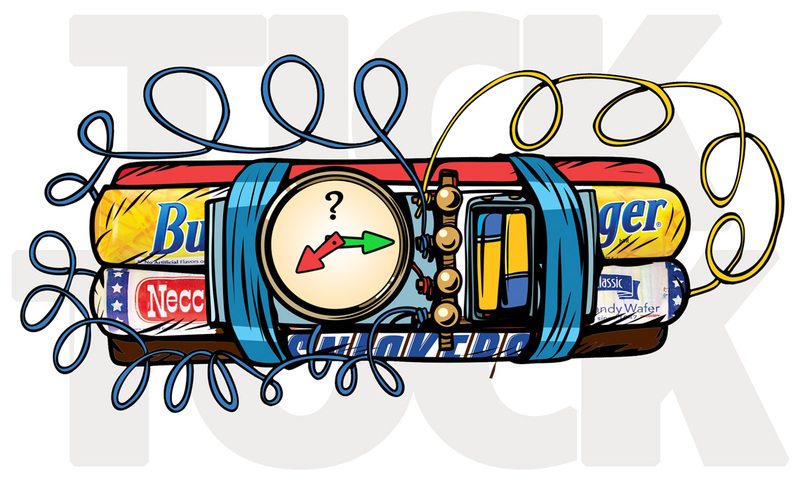 Do you need to stuff your face before the time on your candy bomb expires? Let's explore. The quick answer is yes, candy can go bad. But it’s a little more nuanced than that. Candy is a general term that encompasses a great variety of sweet confectionary products. The degree and speed with which candy will go bad, depends on what it is. So let’s break it down. Store your candy in a cool – room temp or slightly less – and dry place. If it contains nuts or chocolate, it’ll expire faster. If not, the less moisture and fat that type of candy has, the longer it will last. Upper end on lifespan for the most persevering candies is two years, but most are about 6 months. 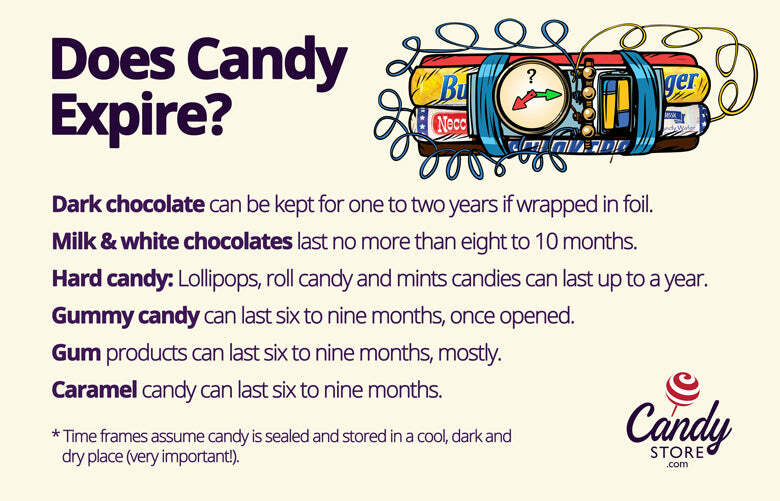 Here are some general guidelines on how long candy lasts before you should consider throwing it out. Sugar is a preservative. Ancient civilizations used it to extend the usable life of fruit and other foods. In terms of health only, the shelf life of some dry hard candies may be years according to food scientist Fadi Aramouni at Kansas State University. “It depends on the properties of the candy,” he said. That doesn’t mean it’ll still look or taste good. There are all types of ingredients like fats that help the flavoring, texture and shape of candy. These other ingredients are the weak links that make candy vulnerable to discoloration, and changes in flavor and texture. Basically, the recipe breaks down over time. Anything with chocolate, fruit or nuts also carries a risk of mold after some time. Greater caution should therefore be used with these types of candy. Dark chocolate tends to hold up better than milk or white chocolate, but none of them should be kept more than 8-10 months under the best of conditions. Speaking of conditions, they are a big deal too. Moisture and heat are big factors. Candy in general doesn’t like heat. It causes candy to melt or get sticky, and the more moisture a candy has the more easily affected it will be by heat. With chocolate, heat can cause it to sweat and form a white or gray film on it called a “chocolate bloom.” A bloom doesn’t make it unsafe to eat, just not as pretty. It’s caused by the cocoa butter separating from the sugar. Cold temperatures can cause this too, for all you who love putting candy in the fridge or freezer. If left to sit too long or if exposed to extreme temperatures, most candy will be seriously affected to the point where you might not want to eat or present it to guests anymore. Wrappers can stick, colors can change, melting (and re-solidifying) can happen. Gummy candy, for example, can melt together at high temperatures. For these reasons, it’s best to store candy at room temperature. We recommend storing it in a dark and dry place where it won’t get much exposure to air flow. According to Aramouni’s colleague Karen Blakeslee, an unusual amount of sticky-ness or a grainy type of texture is a good indication that it’s time to throw that candy out. Crystallization of the sugar has likely affected the candy and it may taste off or change in color. It could even turn moldy if the candy contains nuts or fruit. In general, if a candy doesn’t look or feel like it should, you should probably consider moving on. There are lots more inexpensive candies out there. And even if you are panic-buying your favorite candy before the factory shuts down, there’s no reason to go to extremes, like vacuum sealing it. Odds are, it will come back to life again. Most popular candies do. The American Consumerist suggests that it is not a good idea to eat candy that is not fresh candy. There is such a thing as fresh candy because candy can soften, discolor and expire. While most candy will not expire in the sense that it can make a person ill if eaten, expired candy will be tasteless, misshapen and can even be moldy. Some types of candy will lose freshness before others and each candy type will show differing signs of decay like chocolate discoloration or hard candy softness. Candy suppliers have stocks delivered straight from the factory for shipment to the consumer within days of its production. Bulk candy wholesalers who offer candy and bulk price value are more likely to have a higher stock turnover. So candy comes in fresh, moves out to customers fast, and a new batch rolls in. This is a good recipe for fresh candy. Some candy suppliers will allow candy to sit on the shelves past their prime but the better establishments will not. It stands to reason then that purchasing from these companies will make the likelihood of fresh candy greater. Also a good candy wholesaler will know exactly which products they regularly turn over in large volume. For items they can source but have little demand for the good candy supplier will offer the product but won’t retain it as part of the regular stock on hand. Fresh candy is one of the best treats there is, but there is nothing more disappointing than finding an anticipated confectionary delight ruined and flavorless. So it pays to make sure you buy from a company who will guarantee the candy is fresh and then store it properly. Disclaimer: Always consult your physician on matters that relate to your health. We do not recommend eating candy that is not fresh. We are not doctors, and will not be responsible for any candy eaten that may cause discomfort or illness.